An ambitious trainee therapist, determined to make her mark in the therapy world, seeks supervision and guidance. In her meetings with the 3-Point Therapist she gains much more than she had bargained for. The 3-Point Therapist is the charming story of one trainee's journey in search of professional success and recognition. What she learns is unexpected and changes her predicted path. 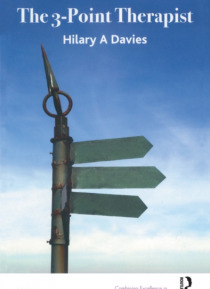 The character… s and situations in this book are purely fictional but the principles, the learning and the practice points are drawn from the author's thirty years' experience working with families in different paediatric and mental health settings. The books style is light, readable and at times humorous - but the messages are strong with far-reaching effect. The trainee and her professional practice are profoundly changed for ever.